Are you reverting to type? Have you ever found yourself acting differently around certain people? You might try to appear ultra-professional in a new job or try to be the perfect partner when you start dating someone new. Sometimes we’ll try to change ourselves to fit into a new environment or so we can be who we believe our new partner wants. But unfortunately, this behaviour is unsustainable because you are essentially attempting to change yourself for someone else. Sooner or later the ‘real you’ will come out. Sometimes it will be fine because the ‘real you’ still fits. But other times the ‘real you’ will simply cause a lot of discomfort and potentially pain to the people around you because you weren’t honest about who you were in the first place. Your new boss may feel you misrepresented your skills and your new partner may wonder if the person they fell in love with ever really existed. Inevitably you will then lose that job and find your shiny new relationship floundering on the rocks. Sometimes we try to make these changes and become new versions of ourselves for good reasons. We want to improve who we are and be better people. But it’s when we do that for others that we become unstuck. 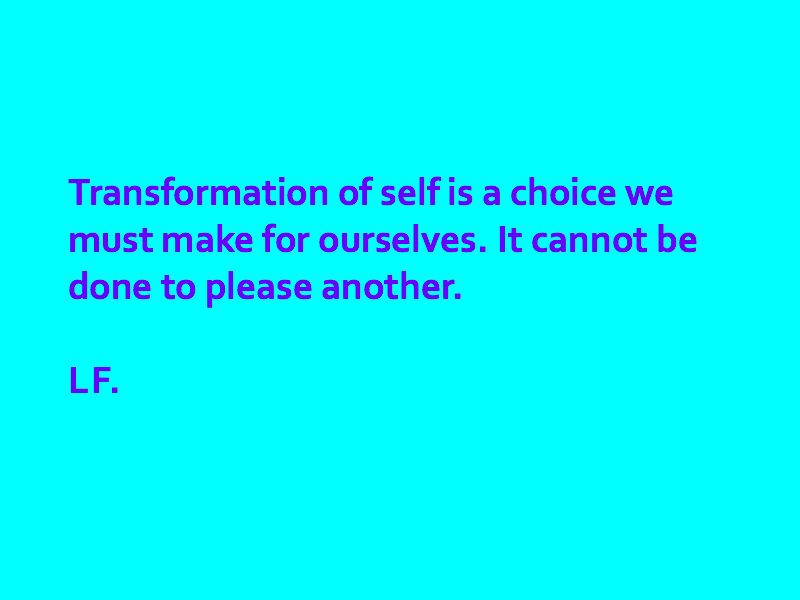 True change and transformation of self is a choice we must make for ourselves. It cannot be done to please another. It must be chosen and come from within to be real and have longevity. Part of you may wish to change but if you are not doing it for yourself, you will not be able to sustain the shift. You might keep it up for a few weeks, a few months, or perhaps longer, but sooner or later the charade will collapse and you will begin reverting to whoever you really are. You will revert to type and begin repeating all the healthy and unhealthy patterns you’ve always repeated. I believe we are all capable of transformation. We can choose to go within, face our demons and do the work necessary to change who we are. We can choose to step up to the plate and do the work. But it’s not easy. Trust me, I speak from experience when I say it can be an excruciatingly painful process. Realisations and life lessons frequently push you to your limits and force you to break through boundaries that no longer serve you. You must face things in yourself that are sometimes dark and very uncomfortable. You must be honest about what is important to you and get real about the things you need to deal with. And while others can help guide you through the process, you must essentially do the work and travel the path alone. Some people may never take up the challenge. Others will start but decide it’s all too hard and simply go back to the way things were because it’s easier. And that’s true. It is easier to simply revert to type and carry on as before. Nothing will change and you’ll be a lot more comfortable. But if you follow through and don’t give up, something quite magical will happen. From all that pain and hard work something quite beautiful will emerge – a strong sense of self and inner-knowledge. You will possess a clearer understanding of who you are and that the only limits are those you impose on yourself. You will judge yourself and others far less because you’ll understand that no-one is perfect and we are all just learning. I’m not suggesting you will become Zen-like all day, every day. Most of us aren’t built for sainthood and will never become wise yogis perched on a mountaintop in the Himalayas. But the process will in many ways bring you peace because as you gain more understanding you will have more forgiveness in your heart for yourself and others. You will also need to keep doing more work as you grow older because, as you become more aware, you will be led to deal with more of your stuff. So the journey will continue throughout your lifetime. I’m not suggesting your ‘type’ is necessarily something that must be fixed. But if you start that walk on the path to self-awareness you will be rewarded with a stronger sense of self and amazing growth. You may even meet someone who becomes the catalyst that causes you to re-evaluate your life and believe it could different. But you cannot make the shift for that other person. You must always make it for yourself. This is something I really needed to hear and it really hit me hard somewhere deep inside. I am so glad to have this topic put into perspective for me.